Have you ever wondered if it were possible to make doughnuts at home with a quick and easy recipe? If that were not a tall enough order, could they also be made in such a way where the resulting bakery treat was reasonably healthy? Of course, it goes without saying, the taste needs to be great. Put a can of coconut milk in the fridge upside down. Once you have made the coconut whipped cream, you will keep a can in there at all times. It pays to get a doughnut pan. It is not really a specialty baking item anymore. I think even large grocery stores have them. The goal of the recipes below, is to satisfy the need for comfort foods of our youth. That time when you could, and did, eat everything. I don’t want to deny my children that luxury. But, if I can switch in a healthier version, we all win. It becomes something we can share. And these are quicker and easier to make than muffins. Less ingredients. Ridiculously simple to make. But you do need the doughnut pan, otherwise it is not even close to the high fat, processed bakery version. Angela has included this in her breakfast section, which is a stretch for me. 1. Preheat oven to 300 degrees F. Lightly grease the doughnut pan with coconut oil. 2. In a medium bowl, combine all dry ingredients. Whisk with a fork to combine. 3. Add the liquid ingredients. Will be a little runny in the beginning, but coconut milk is rather thick and when the chia seeds start reacting the mixture will firm up. 4. Bake for 18 minutes, the doughnuts will be firm to the touch and a toothpick will come out clean. 5. Cool in the pan for about 10 minutes and then invert onto a cooling rack. Make glaze while waiting until doughnuts are fully cooled. When fully cooled, add the glaze with the coconut whipped cream recipe shown below. This recipe is high in saturated fat, but the source is vegan. That means this kind of fat acts differently in your body then if it were from an animal source. Having said that, if the goal is to limit overall calories, this should be used sparingly and infrequently. I make it on a weekend when we are likely to have company and can spread it out for many people. 1. Always keep a can of coconut cream in the fridge, stored upside down. Experiment with different brands for the ratio of coconut water to cream. Trader Joe's makes a thick cream which has almost no water. 2. Turn the can around and open, save the coconut water for smoothies. Scoop the cream into a chilled bowl. 4. Keep in the fridge until ready to use. It will thicken a little more. This is perfect as whipped cream, but can also be used as a glaze for baked goods. Turn muffins into cupcakes, or try the baked doughnuts shown above. 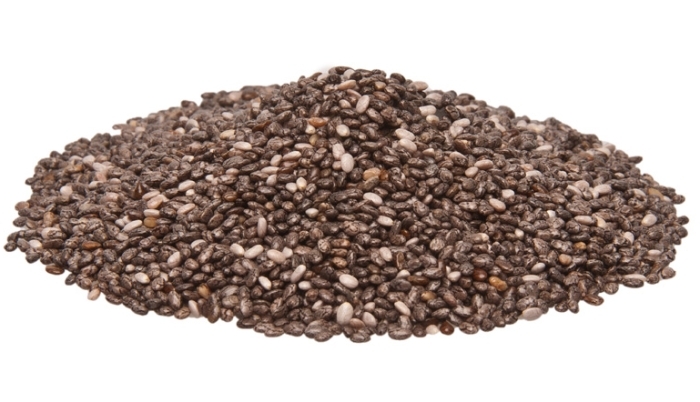 The only other specialty ingredient which might not be on hand in your kitchen is chia seeds. I can’t always find them in my regular grocery store. But do check the bulk bins. There are many brands which package them, but here is a picture of what they look like. If you try these recipes, let me know what you think. I’m curious to see if they bring a little surprise and joy into your kitchen.